As a number of Western-designed mega-ships are prepared for introduction to the Chinese market, brief opportunities will arise over the next couple of years to cruise on these ships in Europe, where they are being built, before they set off for China. Two of these will be the 4,180-berth Ovation of the Seas next year and the 3,560-berth Majestic Princess in 2017. Elsewhere, Azamara Club Cruises, is entering the World Cruise market in 2018 with its Azamara Journey, sailing from Sydney. Finally, P&O Cruises Australia is now available to book in the UK through an exclusive agency agreement with Cruiseco UK, which hopes to have 100 outlets in the UK by the end of the year. If you would like to sample one of the new Chinese market newbuildings, then there will be a couple of opportunities to do so over the next two years in Europe after they come from the shipyards. Royal Caribbean’s 4,180-berth Ovation of the Seas, for example, due to enter service in China next summer, will debut in Southampton in the spring. From there, she will offer three European cruises before making her way towards India, Southeast Asia and Australia. Her inaugural voyages will be 5 nights on April 17, and 7 nights on April 22, both round trips, followed by a 7-night cruise from Southampton to Barcelona on May 3. Once Ovation arrives in her new seasonal home port of Tianjin in July, she will offer a whole series of short 4-, 5- and 6-night itineraries from Tianjin until October. Unlike her sister ship Quantum of the Seas, which is based in China year-round, offering 4-, 5-, 6- and 8-night cruises out of Shanghai, the Ovation will continue on to spend a season in Australia, leaving Singapore on November 30 under an exclusive charter to Australian and UK cruise specialists Cruiseco, bound for Fremantle, Adelaide, Hobart and Sydney. Meanwhile, a year later, Princess Cruises’ newest ship, the 3,560-berth Majestic Princess, will enter service with a series of 5- to 28-night Mediterranean cruises in April 2017, offering a number voyages from Barcelona, Piraeus and Rome. 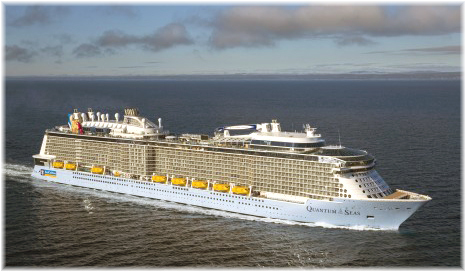 From July 2017, however, like the Quantum of the Seas, she will be based year-round in Shanghai. Not going to China, but another mega-ship debut, will be the 5,400-berth Harmony of the Seas, which will be the world’s largest cruise ship when delivered. She will make a European debut in April 2016 and will sail the Caribbean from Fort Lauderdale beginning in November. Before heading for North America, she will spend her inaugural season based on Barcelona. Perhaps taking a leaf from Oceania’s successes with the Insignia, which has been engaged on World Cruises, since her redelivery from Hapag-Lloyd Cruises in 2014, Azamara has now scheduled a World Cruise for its 684-berth Azamara Journey in 2018. Sydney has been chosen as the departure port for Azamara Club Cruises’ first-ever foray into global voyages, which will end in London. Azamara Journey will sail a 102-night journey from Sydney’s Opera House to London’s Tower Bridge, docking overnight at the two famous landmarks in signature Azamara style. Passengers will also be able to embark earlier in Auckland, New Zealand, as well as extend at destination with a Baltic cruise to St Petersburg in time for a World Cup soccer match. Ports will include twenty-two more stops in Australia alone, followed by Bali, Singapore, Ho Chi Minh City, two nights each in Bangkok and Myanmar, Mumbai, Muscat, Oman, Athens, several Greek Islands, Sicily, Italy’s Amalfi Coast, Rome, Monaco (on the same day as the Grand Prix), Cannes (for the film festival), Barcelona and the Normandy beaches, before arriving in the heart of London at Tower Bridge. The choice of offering embarkations in Sydney and Auckland is notable given that Azamara has never operated in Australia or New Zealand, with Azamara Quest just making its debut Down Under this month. P&O Cruises Australia has now concluded its working agreement with Cruiseco UK, which is now actively promoting P&O’s five vessels operating in Australasian waters and the South Pacific. 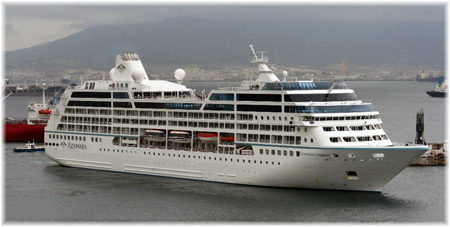 Itineraries include the Australian coastline, the Pacific Islands of Fiji, Vanuatu and New Caledonia, as well as New Zealand and some unique discovery cruises to Papua New Guinea and to Asia. In the near future, Cruiseco will be releasing packages that include air fares, transfers and pre- and post-cruise accommodation Down Under. Through Cruiseco, the UK market now has on line access to the entire P&O Australia inventory and on line promotions and cruises can easily be added in as part of a longer Australian visit. Many Brits have relatives in Australia so joining Australian family members on a P&O cruise is also now very easy. P&O Cruises Australia can be booked by any Cruiseco member agency and a UK-based brochure is now available for distribution.